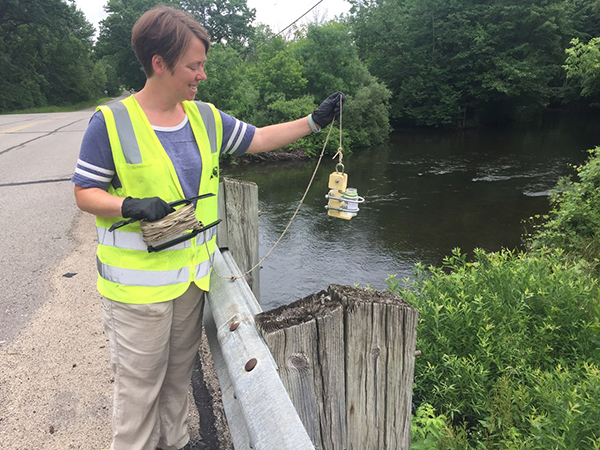 Molly Rippke, Aquatic Biologist Specialist, DEQ, testing for E.coli in the Rogue River, at 12 Mile Road. Photo courtesy of Gretchen Zuiderveen, Rogue River Watershed Partners. The Rogue River Watershed Partners sponsored one of their “Tuesday Talks” at the Cedar Spring Brewery this year on March 27. Rippke, an Aquatic Biologist Specialist with the Department of Environmental Quality, gave a memorable talk and power point presentation about E.coli. She focused on answering these four questions: What is E-coli? How does it get into rivers? Why should we care? What can we do about it? Once a week, for five consecutive weeks, Molly Rippke, with the help of an intern, is testing the Rogue at the same seven locations, starting at 22 Mile Road and ending at Twelve Mile Road. 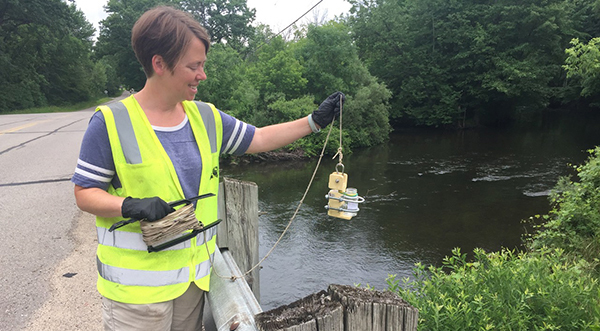 They deliver the samples collected at each site to a laboratory in Lansing that same day. In addition, the team measures the dissolved oxygen content at these sites, a measure of special interest to those who fish the Rogue. E.coli (short for Escherichia coli) comes from the feces of warm-blooded animals, and is a common problem in rivers. E-coli enters rivers through pasture runoff, illicit sanitary connections, failing septic systems, urban run-off, and manure land-applications in agricultural areas.